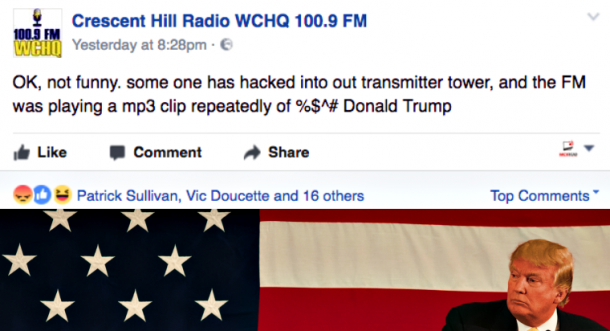 A Louisville Radio station on Friday afternoon posted on Facebook that hackers had hijacked their air waves and played an anti-trump song which over-rode their regular broadcast. According to the post on their Facebook page, Cresent Hill Radio WCHQ 100.9 FM post read: "Ok, not funny. Someone has hacked into our transmitter tower, ans the FM was playing a mp3 clip repeatedly of %$^# Donald Trump". WCHQ program director, Gary Sampson, said that the song which was sung by YG and Nipsey Hussle titled FDT (F*** Donald Trump) interrupted the WXCHQ's FM feed and played continually for 15 minutes until station manager, Kathy Weisbach broke the loop. Sampson revealed that the hackers compromised their airwaves by using software that is capable of interrupting live transmission signal. This software is mean't only to be used in emergency broadcasts including government warnings. Sampson believes that the hack which occurred on Friday wasn't a coincidence because that was the same day that Donald Trump was to be sworn in as president of the United States. The WCHQ program director went on to apologies for the hack adding that the song which was played was against the policy and vision of WCHQ which believed in standing neutral and remain an unbiased radio station for the community. The program director said that the radio station focus was mainly on highlighting and promoting local talents from Southern Indiana and Kentucky. 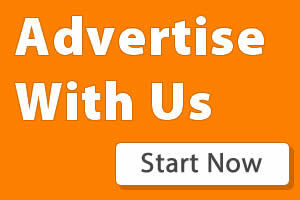 "It's a matter of providing a community outlet for musicians and artists. It's very disheartening that someone would take the opportunity to a political statement. I want to apologise to people who might have heard it and might have been offended. we kind of feel like we are being used," the radio director said. News from Courier-Journal says that WCHQ will be lodging a complaint with the Federal Communications commission because of the profanity that surrounds this rap song.